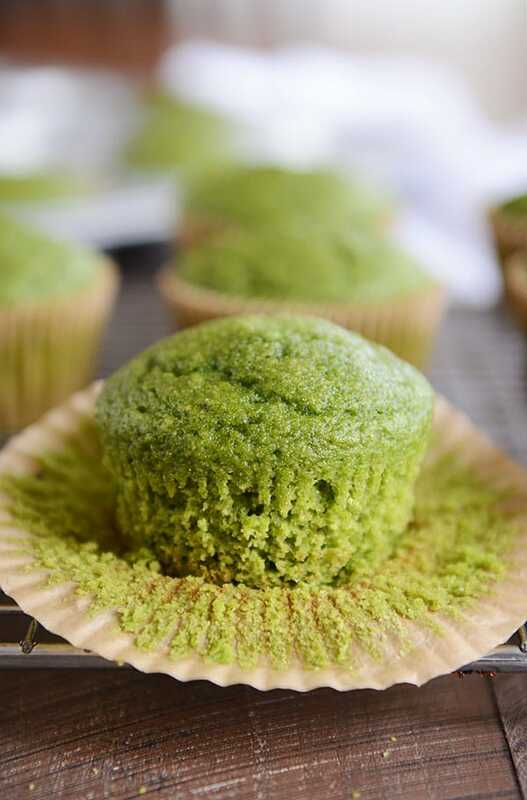 Packed full of healthy nutrients, these all-natural, GREEN muffins are soft, tender, and delicious…and prove that healthy really can be delicious! So if you want to know the truth, I don’t do a whole lot for St. Patrick’s Day around here. Sorry if that revelation is a huge disappointment. I’m not a holiday grinch by any means. I go crazy in my own right for other holidays, but St. Patty’s day is one of the holidays that I’m kind of “meh” about celebrating. At least when it comes to sneaky leprechaun footprints, hidden pots of gold and treasure hunts, and green everything (including all the foods that should, quite honestly, never be turned green in the first place just to humor small children). I blame it on the fact that I was born with green eyes. So I never had to make an effort for this holiday to begin with. And my lackadaisical attitude has stayed with me, I’m afraid. But these delicious little green spinach muffins have certainly earned me some rock star points with my kids over the years. 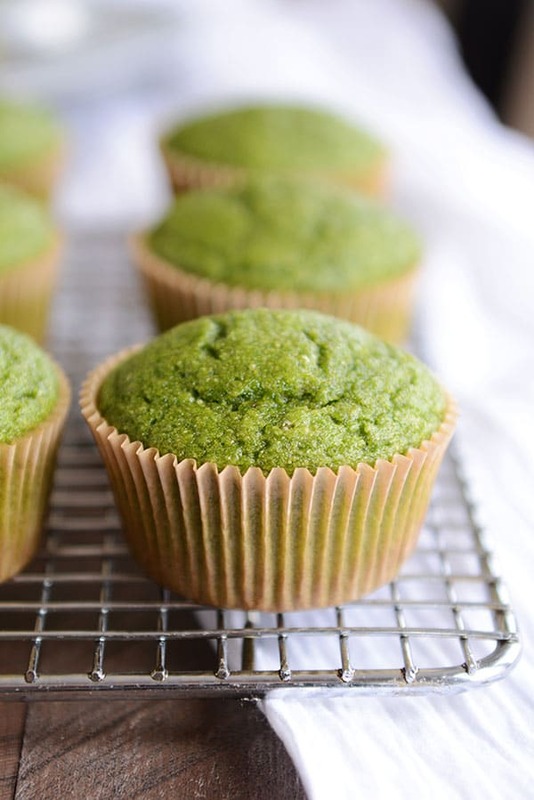 You can’t get much greener than these soft and tender muffins. 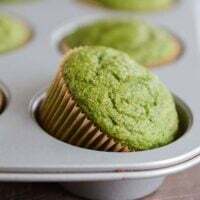 Plus, there are extra rock star points because all that green-ness comes from a whole bag of spinach blended up with other simple ingredients to make healthy, green muffins. And guess what? The cute spinach muffins actually taste good. I promise you can trust me on this one for the simple reason that I’m the last person/food blogger on this earth to get behind food trends just because they’re cute or festive or outrageously unique. I love it when my food looks pretty, don’t get me wrong, but if it doesn’t also taste amazing, my heart turns cold and the recipe is cast out forever. 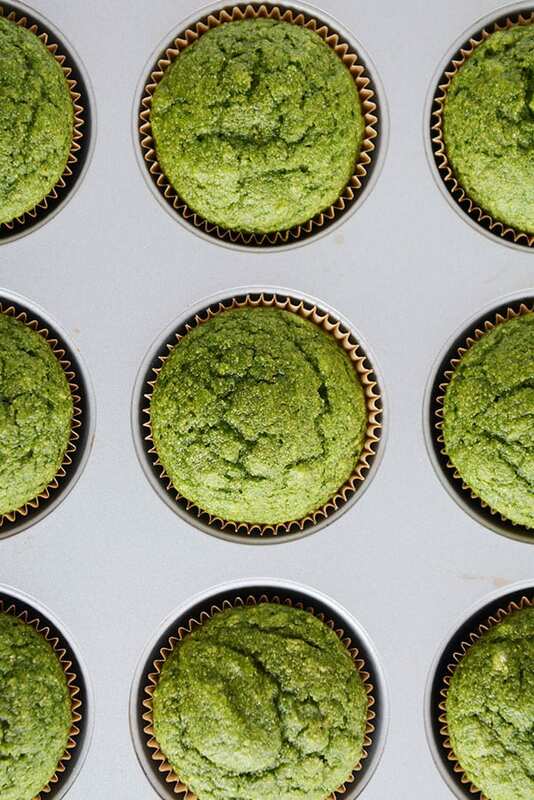 Recipes for these bright green spinach muffins have been floating around the internet for years, so they are hardly a cutting edge, trendy recipe anymore. Since we’ve actually been making these muffins for a while now (a sweet reader, Erin, emailed me a link to the recipe a couple years ago! ), I consider them a solid tried-and-true muffin recipe, especially because we don’t reserve them just for St. Patrick’s Day. We eat them all the time for breakfast and after school snacks, and often, I’ll double the batch and keep the baked and cooled muffins in the freezer. 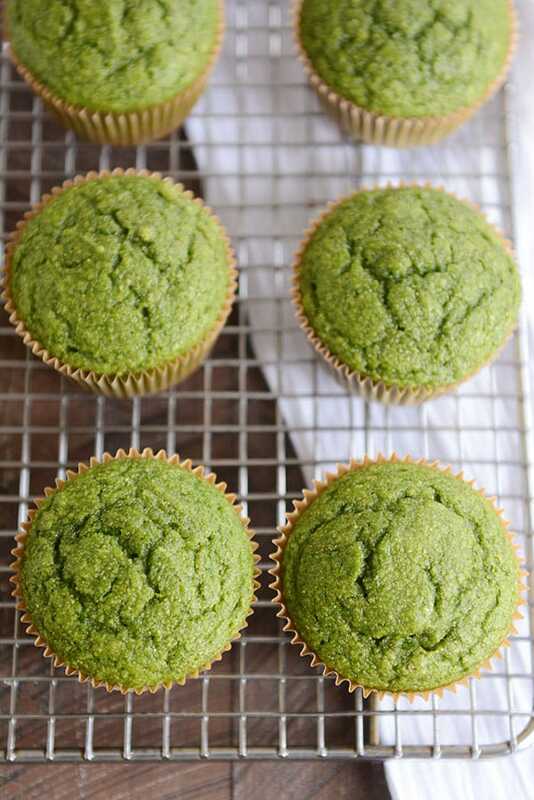 And if you are wondering about the “hulk” part – Erin, who sent the recipe to me, joked that since her kids wouldn’t know who Popeye is, they nicknamed these “hulk” muffins. That name has stuck with us as well. But it also makes me think it’s kind of a travesty that my kids are not familiar with good ol’ Popeye. However, I have caught one or two of my boys flexing in the mirror after devouring a couple of these “hulk” muffins…so there is that. If you are more into the St. Patrick’s Day celebrating than I am and are looking for a festive, fun, green treat/breakfast/snack to serve on the big day, this is a feel-good solution! Packed with spinach and whole grains, these muffins are lightly sweet and ultra-fluffy in texture (thanks to the buttermilk and banana bread-esque qualities). When I made the spinach muffins for the first time years ago, my expectations were low. I mean, it’s a naturally green muffin. How tasty can it be? But we loved these from the start, and it makes me happy that these green muffins of wonder actually taste amazing. The research is tasting good. Really good. That about does it! If you have any fun St. Patrick’s Day traditions, I’d love to hear about them; comment below! Preheat the oven to 350 degrees F. Line two 12-cup muffin tins with paper liners or grease with nonstick cooking spray (the recipe makes between 16-18 muffins). In a blender, add the egg, sugar, buttermilk, oil, vanilla, spinach and bananas. Pour the spinach mixture into the dry ingredients and mix just until combined. A few small dry streaks and lumps here and there are ok. Don't overmix or the muffins can be dry. Scoop the batter into the prepared muffin tins, filling the cups about 2/3 full. I use my #20 cookie scoop to make this process easy as can be. Bake for 15-18 minutes (increasing time as needed as each oven differs slightly in exact oven temperature) until the tops of the muffins spring back lightly to the touch and a toothpick inserted in the center comes out clean or with just a few moist crumbs. Let the muffins cool for a few minutes in the pan; turn them out carefully onto a cooling rack to cool completely. For the flour, you can definitely use all-purpose for the whole wheat flour or use a combination (half whole wheat, half all-purpose). For the sugar, if you want a healthier alternative to the granulated sugar, try maple syrup, honey or coconut sugar. Finally, for the buttermilk, if you don't keep it on hand or don't have any, mix equal parts sour cream (or plain Greek yogurt) and milk together for the perfect buttermilk solution. I also forgot to mention that the color of these muffins darkens over time (the muffins we have leftover to eat the next day are dark green instead of bright green). Also, we prefer these muffins after they've been baked and cooled - the flavor and texture is better than straight out of the oven (although we've found that a quick 5-10 second spurt in the microwave can help warm them slightly without affecting flavor/texture). Disclaimer: this post contains Amazon affiliate links for products I’ve purchased from there. « Previous PostKitchenAid + Chatbooks Giveaway Finalists Need Your Votes! I’ve made this recipe multiple times now and it was the perfect St Patrick’s Day breakfast this morning! 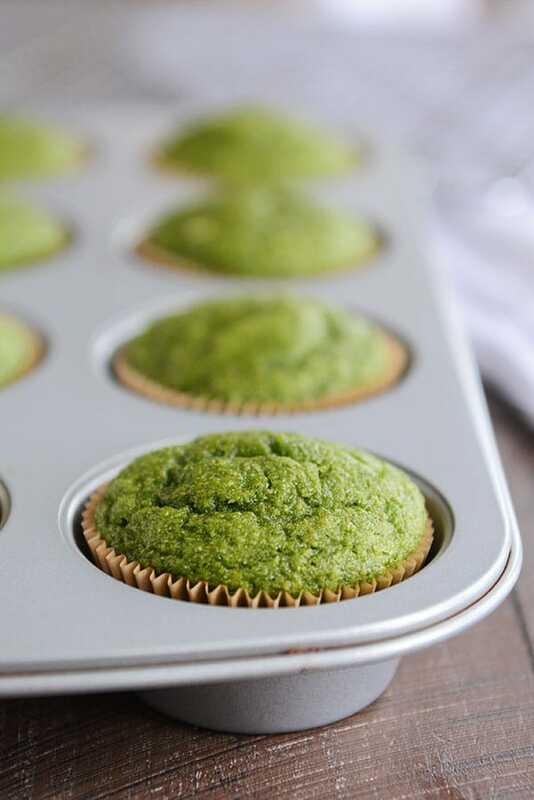 The taste is like a banana muffin, but the green color from the spinach make them so much fun. My whole family loves them! Thanks for being my go-to site for recipes Mel! Thanks, Amanda! I’m kicking myself for forgetting to make these this year. St. Patricks Day totally snuck up on me! Normally, I LOVE your recipes. In fact, I keep checking your website for a cookbook because I would totally buy it. But this one is just ok. Lacking in flavor. Plenty moist and good texture but the flavor is just ordinary. Maybe I should mix in some mini chocolate chips. If you make a cookbook, this one can just be skipped over, but definitely include your divine Apple Crumb pie recipe. That was a huge hit this thanksgiving!! Which muffin recipe should I try next if I want one with more flavor but still as hearty/healthier like this one? My family loves this recipe! Thank you for sharing! I’ve made these and we loved them! I’m wondering if you have ever played around with adding cocoa powder to them? Just trying to get my chocolate in all forms. I haven’t – sorry, Aimee! Sounds like a fun idea, though! Loved it! My boys loved it too. My only issue was that a lot of the muffin remained in the wrapper after peeling. Not sure why that happened. These are yummy! My kids ate almost the whole batch in one sitting! They are seriously green, and seriously moist. I shared the recipe with everyone I know. I love all your recipes PS- you cannot taste the spinach. At all. These tastes wonderful and my kids loved them. Mine did not turn out green- they were a light brown with green specks- did I do something wrong. I used a cup of spinacha maybe I didn’t use enough. We love them though! Wow. Super impressed. I really didn’t think these would be so good. but they are delicious! We made these today! So delicious and so green! We all loved them! Made these “Leprechaun” muffins this morning and everyone loved them. Can’t taste the spinach at all. Thanks for another great recipe! Any progress on those bran spinach muffins? I’m excited to try these tomorrow! These turned out soooo good! Like many people, I loathe the word “moist”, but these muffins were probably the most moist baked good I have ever made. all 3 kiddos (ages 2, 4, and 6) loved them, despite the fact that they looked like they were “made out of poison” . Thanks for a great recipe! Do you store these in the refrigerator or are they ok to leave out overnight for the next day? They are fine to leave out overnight (I’d just make sure they are well-covered). These are deliscious!!! Any idea of the nutrition info? I don’t have that info – sorry! came out ‘flat/sunken’ (but still delicious!) but this time- I added a few extra minutes to the baking time and got perfect little domed tops. We add mini chocolate chips and this is a breakfast win. THANKS MEL!! Yummy! I have a question for you, do you usually measure by weight or volume? I did by weight this time and the batter was quite a bit thicker than I anticipated. They did turn out beautifully though. Not smooth like yours, tall and crackly on top (and I made 18). I’m quite pleased. If a recipe gives weight amounts, I always use them over the volume measures. Thank you for all you do to make our homes better. You are a gift in my life! I was attracted to making these muffins not only it looks pretty but uses vegetable, fruit and no artifical colouring in it. A five star for this healthy recipe. We love these. So clever and tasty, even for my son with food sensory issues. I had him close his eyes and taste one. He loved it and told me, ‘Mom, you could have lied and told me it was just green food coloring and I would never have known!’ But I’ve promised I’ll never lie about what’s in his food. I want him to know and be comfortable with eating healthy ingredients! Question for you- have you experimented with chocolate spinach muffins? That would be so awesome! My son is on the autism spectrum and it is SO difficult to get him to eat anything, much less vegetables. Well, let me tell you, he gobbled these up and it made me the happiest mom ever! P.S. I called them ‘Shrek muffins’ because he is not so much into Hulk. So happy your son loved these, Kelly! Yum! These are moist and you cannot taste the spinach (even my 5 yr old avowed spinach hater didn’t figure it out). And the Hulk name was fantastic– it was a huge selling point! Added about 3/4 cups chocolate chips and it tasted very similar to chocolate chip banana bread. Delicious! My kids loved them; I didn’t tell them about the spinach until after they gobbled them up! I love that they’re so healthy. They were moist too! I often use applesauce in part or in place of the oil. I might try that next time. Thanks for the yummy recipe! Not my personal favorite, I have a hard time with banana flavor mixed with a veggie but I give it a five for my kids. My 5 year old and 3 year old loved them and when I was napping the 3 year old lied to my husband and said she was allowed to eat as many as she wants….so…she pounded down four more before he realized she wasn’t telling the whole truth. haha. Anyway, don’t worry about not celebrating it, just some fun ideas. I’d say it’s right around 2 1/2 cups (lightly packed). When I weighed my spinach, it turned out to be more like 4 cups! Has anyone figured out nutritional info on these. Calories, ww points perhaps ?? You know what? I forgot I decreased the sugar by 1/4 cup. 4 points reflects using 1/2 cup. Haha I did the same thing by accident! Delicious! You can’t even taste the spinach. It was all in the name with my boys! Hulk/superhero anything is a sure winner , plus we all loved them! I didn’t have white whole wheat flour, so I substituted 2 cups of whole wheat bread flour and 1/2 cup of all purpose flour. Definitely going to make these again! Have you tried freezing these? You and your blog are a true gift to society :)!!! Made them today for a delicious – Day After St. Patrick’s Day fun. I never have my act together for this holiday either…but they were awesome and everyone loved them. A little dab of butter was perfect on them. Made these last night for our St Patrick’s Day breakfast today. Love them! I ate a few myself. 🙂 I used more like 9oz of spinach (most of an 11 oz bag, didn’t measure) and they were fantastic! I think these with a green smoothie will become our traditional St Patrick’s Day breakfast now. Thank you! I made these last night and they turned out great! Mine were a little darker green because I used coconut sugar which is dark. White sugar probably would have resulted in a brighter green color. The kids liked them! Glad to hear coconut sugar worked out in the muffins, Amy! I made these today for an after school snack and they were delicious. They are very sweet and have a nice hearty texture. Fun for Saint Patrick Day! For those wondering about subs for allergies or health reasons, I subbed almond milk for buttermilk, a flax egg for the egg and used 1/4 c applesauce to replace the oil. They​ still rose beautifully and were light and fluffy. They were a fun, yummy addition to our holiday breakfast. All six kids and my husband loved them. Thanks! Thanks for the details of your substitutions! How do you measure the spinach? By weight? Or a measuring cup? In the oven as we speak, can’t wait to try. Have to share: mixed up the batter (added chocolate chips because why not?! ), plopped the spoonfuls into the muffin tin, slid them in the oven, then took a lick of my batter covered finger. OOPS! Forgot the sugar! Thankfully was able to take them right out and [over]mix the sugar right in, but I was THIS close to having a whole batch of spinach chocolate chip biscuits! :\ bleh. Hoping I was able to save them, my kids will love the fun green! I have to laugh.. my boys (and girl) check out their muscles while eating “hulk” smoothies. I had to think of a quick fun name to get them to love them. I’m glad we share the hulk tradition My mom would always make green pancakes for st patties. So that’s what I did today! I’ll have to try these. They sound yummy!!! Thanks, Mel, for helping me redeem myself from being a St. Patrick’s Day grinch! I pulled these out of the oven an hour ago so they could be my kids’ after school snack. They taste great and look so fun in all their green glory. My kids loved them. And dinner tonight is your Shepherd’s Pie recipe (the original one, not the one with chicken and kale). So again, thanks for helping us have a little fun on this silly holiday! Sounds like our day! 🙂 That shepherd’s pie is my kind of St. Patrick’s Day meal. Made these for an after school snack today and everyone LOVED them! They were impressed. Thanks! Soooo good! I made these for St. Paddy’s day today, and they turned out fantastic! I had a giant tub of spinach in my fridge that was about to go bad, so I was happy to be able to use up so much of it! I used my kitchen scale to weigh the 6oz. My boys have happily devoured them, and my daughter will get to try hers when she gets home from school very soon here. Thanks for such a fun recipe! I love that there is no food dye in them. 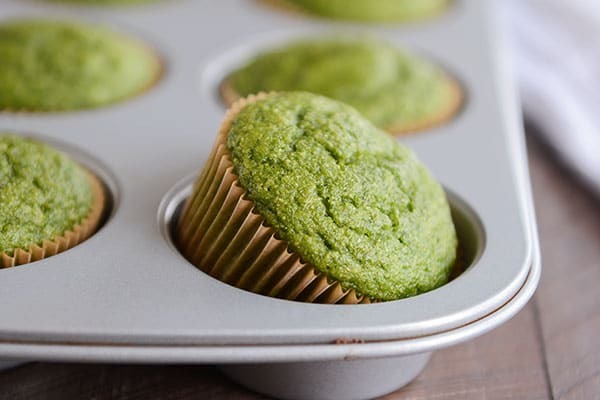 I made these muffins today, but they weren’t very green? They had more of a brownish/green tint. I may not have added enough spinach. I used a measuring cup to guestimmate 6 oz. Next time I’ll put them in the blender first and use that as my measuring guide. My kids still loved the taste! I appreciate you posting these fun, healthy recipes. Hey Bridget – sounds like it might have been what you suggested: not enough spinach. Glad they were still ok! These were a huge hit this morning. Thank you! I didn’t have spinach so I subbed baby kale, I worried it would be too strong of a flavor but you can’t tell. They were perfect! That’s great to know! The one time I used kale, it wasn’t baby kale, and the taste was a little strong. Glad to know baby kale is the key! We do the all green foods for dinner–green food coloring is my favorite friend today! These are perfect! No green food coloring needed…thanks!!! When I saw the image, I figured food dye. How brilliant that they’re colored with spinach. I love this! I’m always looking for ways to sneak greens into my kids’ food. (When they were babies I used to grind chard into their peanut butter – they never even noticed.) This looks a lot more appetizing. Thanks! Wonderfull effect ! My daughters called them shrek’s muffins, and loved them. Thank you for this gorgeous recipe. Haha, love that name! Might have to adopt that. These are so good! My kids and I made them this morning and they will be added to the muffin rotation around here! You never disappoint!!!!! So fun! Baking them now. My husband has been on my back about serving more vegetables so these are going to please everyone! I discovered you about a year ago and I swear your recipes have made me a better mom and benefitted my family so much–thank you for helping the rest of us! I just made them and WOW!! So good! You win again! Haha, I didn’t catch that, but it made me smile. What kind of oil do you usually prefer using in your muffins? And have you tried the applesauce instead of oil but kept the bananas? Haha, so many questions! Thanks, we love all your recipes! And I’m pretty lame when it comes to St. Patty’s day…we usually just have a green smoothie and call it good. If we’re feeling really ambitious we have a key lime pie. I love an excuse to eat pie. I just made these and subbed all the oil with applesauce instead. I kept the banana amount as listed. Turned out great! These look awesome! My 5-year-old would love the Hulk idea. I want to give these a try tomorrow. Thanks Mel! I just made these for my four little kids, and they taste like delicious banana bread! I love spinach smoothies, so the whole blending spinach and bananas was pretty natural to me. Everyone was a little nervous to try them, but totally loved them. Thanks for a fun and healthy St. Patrick’s Day recipe! I am that mom who serves a ton of green veggies and a fruit rainbow on St. Patrick’s Day instead of lots of dyed green food, so this was perfect for us! I’m glad your family liked them, Julie! Just made these — they are SO good. If you close your eyes, they’re pretty much just a tasty banana muffin. We increased the batch to fully use a 10-oz bag of spinach, and made some mini and some regular sized, both with and without chocolate chips. 3 of us are home right now, and all 3 of us gives these a major thumbs up. Thanks, Mel! Makes me so happy, Alicia! I had to smile at your “if you close your eyes” comment – so funny how we really do eat with our eyes first. These look so interesting. We all love spinach, so I know these would go over well. Your whole grain honey bran muffins (made with all honey vs. part molasses for us) are my favorite muffins. But I really love all your muffins, so excited to try these. I use the “If You Care” brand of unbleached muffin liners. I find them at Whole Foods. I absolutely love them. Never have to grease the muffin liner with any recipe. The muffins just come right off without losing any yummy muffin crumbs! And I love my King Arthur Flour muffin/scone scoop–fantastic!!! These things make me happy when I make my muffins. Things like that make me happy, too! Thanks for the recommendation on muffin liners! You can find the If You Care unbleached muffin liners in bulk on Amazon subscribe and save. That’s a lot of muffins! Just came here to print out this recipe to make right now for a quick breakfast for my peeps to eat over the weekend while I’m working. Didn’t quite have it all together to get ’em made this morning! Can’t wait to try these!! Thanks for sharing! My mom went all on growing up on St Patrick’s day so I love too as well. We always invite our church’s missionaries over for a fun festive dinner and wear crazy hats, accessories while we eat (and then send pics to their parents 🙂 It’s been a fun tradition! I just made these! My six-year-old inhaled two for an after school snack! They are delicious, thanks! I’m totally making these on Friday! They look amazing! Could I sub almond milk for the buttermilk? My daughter needs a dairy free diet. Could certainly try, Liz – I’m guessing it would work (the recipes I used as a starting point both used regular milk and one suggested almond milk, I believe). Do report back if you try it, my daughter is in the same situation! They worked fine with almond milk. I did like the addition of Guittard semi-sweet chocolate chips, which are dairy free! My daughter enjoyed them. However I think the green color threw off my boys who didn’t eat them as well. I would like to try again with buttermilk for them. I used a Vanilla almond milk yogurt and made up the difference with almond milk. Turned out fine for my dairy free girl! Would frozen spinach work? Because other than that I have all the ingredients on hand! I haven’t tried frozen spinach, but it’s probably worth a try! I just made these with my 3 year old. Thank you for a great easy, healthy and fun recipe!!! Update: You really cannot taste the spinach! Daughter bought leprechaun story, dad thinks it’s food coloring. We all like spinach, only maybe not in a muffin?! They taste definitely great though! Looks amazing! We have been on a huge spinach kick lately, so I will definitely be trying these out soon! the color is quite off-putting- don’t know if my family could get past it. There are so many more muffins that have an appetizing color. I’ll pass on this one. Delicious! I made them for lunch for 4 hungry boys. I ended up eating two of them with my lunch as well and I may be getting a third. I had spinach I needed to use anyway so this was perfect. Thanks! Yay! So happy you made them so quick and that you loved them! Yahoo!!! I am so glad to hear your family has enjoyed this recipe!! We still make it all the time too! Oooh, I will definitely try! Could you substitute kale for the spinach? Hey Merideth – I tried it once…and it was kind of awful. The taste was definitely more prominent than the spinach. Could I use frozen spinach if I thawed and drained it? Could certainly try – I’ve always used fresh so I can’t say for sure. do you remove the stems off of the baby spinach or just leave them on? Nope, I just throw it all in there without removing the stems. So I’m allergic to spinach. Wondering if you think the spinach is vital to the recipe (beyond being needed to add the green color)? For this recipe, yes, I do think the spinach is necessary (it adds moisture to the muffins and without it, I’m not sure how the texture would be). I will definitely make these tomorrow to start our day. (way better than green eggs and ham) You were spot on with the cheesy turkey sloppy joes and earned my boys’ trust of your recipes. Have you ever tried adding chocolate chips or nuts? Hey Sheila! Yes, I’ve popped mini chocolate chips in the batter before. Goes without saying, it was a delicious choice. 🙂 Haven’t tried nuts, though. Wow I will DEFINITELY be making these! Although it does mean I have to go to the store to buy some spinach, I ran out yesterday… I might sub part of the flour with old fashioned oats though! Haha. That’s what I get for staying up until midnight to post a recipe. Thanks for the catch. These could very possibly make an appearance on April 1st at our house. We have an inside family joke about fish oil muffins, these would be a great follow up. Haha, without even knowing your inside family joke, this made me laugh. Do you think you could use applesauce in place of bananas? Just ate the last banana for breakfast and not sure I’ll make it to the store today. You could definitely try. I’ve experimented a lot with these muffins and always come back to close to the original – when I’ve used applesauce, they’ve turned out a little gummy in my opinion.